1. Are you currently reading scripture? How often? If not, why not? 2. What is the significance of the Davidic Covenant? 4. How do we link David to Christ and ultimately, Christ to the Old Testament? 5. Who is always a witness to our sin? 6. Why is it “important” to fully understand our sin? 1. As we note the placement of Psalm 22, 23, and 24 what progression do we notice? 2. From what perspective does David present Psalm 23? Why is this important? 3. How does our understanding of sheep being ignorant challenge us as believers to embrace rather than ignore the teachings of our great Shepherd? 4. Why is the parallel of us to sheep appropriate in regard to dirtiness? 5. How do we as defenseless sheep defend ourselves? Have you ever felt God’s rod of correction bring you to safety? 6. What are the three primary enemies that we face as believers? What is our greatest against antidote against this unholy trinity? 7. How have you seen growth in your own life in walking through deep valleys that you may not have experienced without walking that valley? 1. 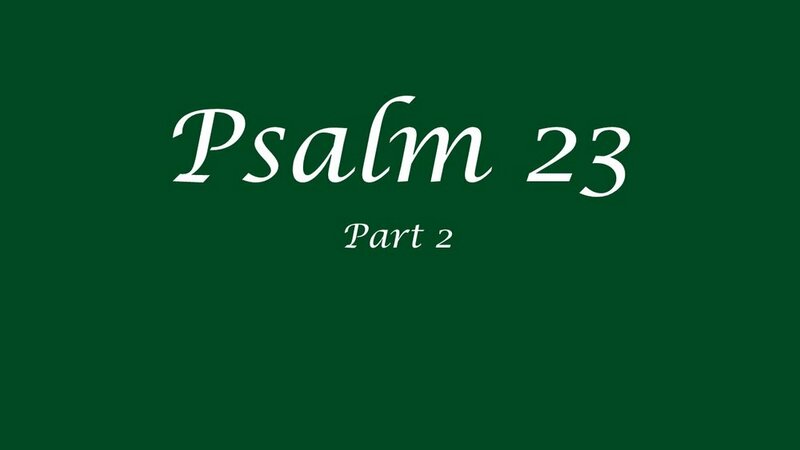 Why is it important that we know the placement of Psalm 23 in the Scriptures? 2. What is the context of David introducing a “shepherding theme” in this Psalm? 3. Discuss the meeting of the phrase “I shall not want” in this Scripture. 4. Describe times in your life where the Lord has been a Provider, Protector, and/or Preserver. 5. Why does the Shepherd in this passage make his sheep lie down; how does this apply to our lives and our shepherd? 6. Why does the Shepherd in this Scripture lead in paths of righteousness “for his name’s sake”?